At Sarajevo Model UN 2018 there will be a simulation of working procedures of four councils. Scroll down to see which councils will be simulated, the rationale for establishing individual councils, and its scope of responsibilities. Please bear in mind that as of 2018, Sarajevo Model UN will have classifications of councils depending on previous Model UN experience. Please familiarize yourself with the council classifications below. High school and university students with no previous Model UN experience are eligible to participate in this committee. 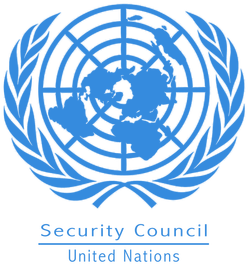 Participants whose prior participation in Model UN activities fall below 4 Model UN conferences will be eligible to participate in intermediate committee. Only university students with a significant previous Model UN experience (at least, 4+ Model UN conferences) are eligible to participate in advanced committees. The Security Council has primary responsibility for the maintenance of international peace and security. It is composed of 15 members of which 5 of them are permanent (United States of America, Russia, China, France and the United Kingdom). Under the UN Charter, all Member States are obligated to comply with Council decisions. and security. The Council has developed and refined the use of non-military measures including arms embargoes on travel and banks, and restrictions to guard against the exploitation of natural resources to fuel conflicts, as well as taking a lead role in the coordination of international counter-terrorism efforts. Visit the link below to find out more about the UNSC's work and adopted resolutions. Topic A: "Prevention of the militarization of outer space"
Topic B: "Maritime Piracy in the Gulf of Guinea"
Topic A: "Eradicating sexual violence against women"
Topic B: "Strengthening girls' education and empowerment in the global economy"
The UNHRC is an inter-governmental body responsible for strengthening the promotion and protection of human rights around the world. Its 47 seats are filled by member states elected for three-year term. The UNHRC address human rights-related situations in all UN member states such as freedom of association, of religion or speech, women’s rights and LGBT rights. the High Commissioner for Human Rights and engages the United Nations’ special procedures. Topic A: "Protecting Human Rights in contexts of terrorism and counter terrorism"
Topic B: "Human Rights commission on Turkey"
The General Affairs Council coordinates preparations for European Council meetings. It is also responsible for a number of cross-cutting policy areas, which include EU enlargement and accession negotiations, the adoption of the multi annual financial framework and cohesion policies. The General Affairs Council is in charge of ensuring the consistency in the work of all Council configurations. It prepares and follows up on meetings of the European Council. This Council is mainly composed of the European affairs ministers from all EU member states. Topic: "Brexit negotiations between the EU and the UK"